VISIT THE ANCIENT MAYAN CAPITAL CHICHEN ITZA, ONE OF THE NEW SEVEN WONDERS OF THE WORLD, AND A CENOTE! 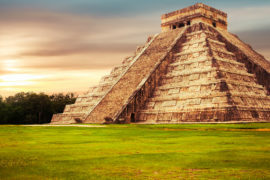 Explore the ancient Mayan Ruins at Chichen Itza with this tailor-made tour. Learn everything about it from your own private guide. Enjoy the comfortable journey of an exclusive transportation to the Mayan World! Our experienced guide, with a huge knowledge of the Mayan culture, will give you a complete explanation of Chichen Itza and its history! Chichen Itza is announced as one of the New Seven Wonders of the World and is the most visited Mayan City of entire Mexico. So let your personal guide take you to this stunning site and have a once in a lifetime experience! We will pick you up at your hotel with your private transportation and drive to Chichén Itzá, which takes 2,5 hours. Arrival at the archaeological site and one of the new seven wonders of the world. During the tour your own certified guide will give an introduction to the historical meaning and mysteries, yet to be discovered, at Chichén Itzá. The tour will last approximately 1,5 hours. Afterwards, there is time to enjoy this monumental pre-Colombian city on your own. Admiring the Temple of Kukulcan, known as El Castillo, or visit the Astronomical Observatory. There is also the possibility to take pictures or have some time to relax. Lunch with a buffet in Mayaland. Snorkeling in the crystal clear waters of a Cenote (underground river). Visit at the craft center. Travel back to Cancun/Riviera Maya. Arrival back at your hotel.